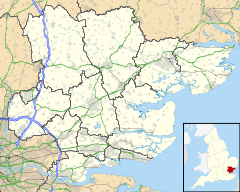 Rayleigh /ˈreɪliː/ is a market town and civil parish in the District of Rochford in Essex, England, located between Chelmsford and Southend-on-Sea. It lies 32 miles (51 km) to the east of central London. It had a population of 30,196 in 2001, increasing to 32,150 at the census 2011. The name Rayleigh is Old English in origin deriving from rǣge ('female roe-deer or she-goat') and lēah ('clearing'). Therefore, the name means overall 'wood or clearing of the wild she-goats or roe-deer". There have been a scattering of stray finds around the town from Prehistoric and Roman times, including some Roman roof and hypocaust tiles found within the fabric of Rayleigh Church. This suggests there was a Roman habitation site within the area. However, there is little evidence of any density of population here during this period. One significant archaeological find was in the early 2000s at the western edge of Rayleigh, at the site of the former Park School in Rawreth Lane. An early Saxon cemetery site was discovered here, with 144 cremation burials and evidence of just one high-status female inhumation burial. By the end of the Saxon period, there was definitely a village here, as it is recorded in the Domesday Book, when it was held by Swein of Essex, the son of Robert FitzWimarc. The most significant historic monument in Rayleigh is the great medieval mound of Rayleigh Castle. This was an early Norman motte and bailey castle, of which only the motte and its surrounding embankments remain. Despite the loss of its timber superstructure and later stone buildings, its height and bulk mean that it still dominates the town centre. A courthouse was erected in Rayleigh in 1338. This was apparently resented by the townspeople, who turned out in force to destroy it, with 20 ringleaders later arrested and tried. The forests around Rayleigh were royal hunting grounds. It is recorded that King Henry III hunted here in 1222, and the three King Edwards also visited. One of the oldest secular building in Rayleigh is 91 High Street which houses Pizza Express downstairs and Rayleigh Town Museum upstairs. The Regal Room in the museum is dated circa 1350. It is suspected that some of Rayleigh's older Brick build buildings may contain portions older than this. know all men of special grace who have the will to repair certain Chapel in the said town and to build a new a certain belfry we have granted them the foundations and to take away and use any stones found theren". "No church within the hundred was more splendidly adorned; none were so richly furnished with plate, vestments and other accessories for the celebration of the divine service; none were so rich in painted glass; none have been more mercilessly despoiled"
During Henry VIII's reign, deer were constantly taken from here to replenish the herds in Greenwich Park. During the 1990s many new housing estates appeared on formerly greenfield areas of the town, with the East of England region currently pushing for even more homes to be built in the area. This has caused some controversy locally, with residents of Rayleigh feeling that the areas surrounding the town should be preserved with more care. The civil parish of Rayleigh became part of Rochford Rural District in 1894. In 1929 it was combined with Rawreth to form the Urban District of Rayleigh, which was abolished in 1974 when the area became part of the District of Rochford. The constituency of Rayleigh and Wickford is represented in the House of Commons by the Member of Parliament Mark Francois of the Conservative Party. In 2018 Rochford District Council has 25 Conservative members, 3 Liberal Democrats, 3 Green Party, 2 Labour, 4 independents and 4 members from Rochford Residents Party sitting on the council. Rayleigh Town council is also Conservative controlled, comprising 18 Conservatives, 4 Liberal Democrats, and 1 independent. Consultee on Planning applications in Rayleigh. Christmas Lights and organisation of switch-on event in Town Centre, King George V Playing Field in Eastwood Road, floral displays in Town Centre and entry to Annual Anglia in Bloom competition, CCTV in Town Centre, benches, salt bins, litter bins, bus shelters, some street lighting, heritage and memorial plaques, and the Town Centre clock. Consultee on crime & disorder reduction strategy within Rochford District Member of Rayleigh Windmill management committee. The Civic Suite and Information Centre includes the Council Chamber, Committee Rooms, Transportation and Hackney Carriage Office and is located on Hockley Road. The Citizens Advice Bureau and Registrar's Office are also located here. Rayleigh is served by two prominent modes of public transport; bus and train. The bus services are run by Arriva Southend and First Essex, and usually terminate at Rayleigh railway station. Abellio Greater Anglia run the rail line which leads from Southend Victoria to London Liverpool Street, stopping at Rayleigh, running every 10 minutes during rush hour. First Essex also operate an hourly coach service to Stansted Airport, numbered X30, which makes a stop at Rayleigh railway station. Looking up the High Street towards the church. Rayleigh has two secondary schools: Sweyne Park School, formed by the amalgamation of the Sweyne and Park schools, and FitzWimarc School. It also has seven primary schools – Down Hall, Edward Francis, Grove Wood, Our Lady of Ransom (Catholic), Rayleigh Primary and Wyburns. The seventh, Glebe Primary School with UHI, was created in September 2014 through the amalgamation of Glebe Infant and Nursery School and Glebe Junior School. In addition, St Nicholas C of E Primary School, a long-established school for the adjoining village of Rawreth, moved in 2006 to a new building just on the Rayleigh side of the parish boundary. Rayleigh has a golf club on the outskirts of the town; Rayleigh Club (previously Lords Golf & Country Club) is situated on Hullbridge Road to the north of the town. Rayleigh has a number of parks and playing fields. Located next to Bull Land, Hockley Road and Websters Way. Its two grass football pitches are used by Rayleigh FC, Chronicles FC and Ralee FC. It also has a skate park and a children's playground, containing a variety of play equipment. The park is also home to Rayleigh Bowls Club (who lease the use of the Pavilion). Rayleigh Lions holds an annual fireworks display on the playing field. Sweyne Park is controlled by Rochford District Council. It is situated north of Sweyne Park School and can be accessed in several ways. The entrance in Downhall Park Way has a small car park, and there is a play area. It has another smaller entrance in Downhall Park Way, adjacent to Canterbury Close. It can also be accessed from Victoria Avenue. In 2008 an entrance was established from Priory Chase. The park has a pond. It has a bridleway running round its perimeter of about 2 km (1.2 mi). Kingley Wood stands on a steep hill slope beside the A127 and is visible as you approach Rayleigh from London. The small wood is the only surviving ancient wood in Rayleigh, but it has rich and varied wildlife and a well-documented history. This is a 64-acre (26 ha) broadleaved wood established in the late 1990s. The wood was designed and planted by a partnership of Local people and the Woodland Trust. There is a car park at the Grange Community Centre in Little Wheatley Chase, and access to the wood is across the playing fields. Rayleigh Town Museum occupies the 1st floor at 91 High Street and contains many artifacts telling the history of Rayleigh. Former Post Office in Rayleigh. There is a small outdoor market on Wednesdays. Until 2011 it was located next to Rayleigh Civic Suite and Information Centre, opposite Holy Trinity Church. In 2011 it moved to the taxi rank in the town's High Street (outside Boots). The market dates back to before 1181 when it was inscribed in the Exchequer Records of Henry II. The Dutch Cottage, the smallest and oldest council house in the United Kingdom, can be visited on Wednesdays by prior appointment. Rayleigh Windmill has been renovated, including a structural renovation of the 19th century brick built building has now been completed. The basic external brickwork has been repaired and the interior has been transformed to provide four storeys of modern display facilities which has turned the windmill into a major tourist and educational attraction in the county. The changes to the windmill allow the public to view the interior and to exploit this local historic amenity for cultural, educational and tourism use. Rayleigh Mount, a National Trust property adjacent to Rayleigh Windmill, is the site of a Domesday castle erected by Sweyn of Essex with distinctive motte-and-bailey defences. From its summit it offers sweeping views across the Crouch Valley. The Church of England parish church of the Holy Trinity is at the top of the High Street. A church existed on the site in Saxon times and the present building has a Norman chancel. The bell tower was built in the 15th century and includes stone taken from the castle when that fell into disuse. The church has an impressive Tudor brick porch. The Gothic Revival architect C.C. Rolfe restored the chancel in 1873. The parish church of Saint Michael and All Angels is in Sir Walter Raleigh Drive near Sweyne School. It was built in the 1950s when Rayleigh expanded considerably. It has a multi-purpose building which is used by other local groups as well as the church. Our Lady of Ransom Catholic Church is on London Hill. The United Reformed Church is on Crown Hill. The Baptist Church is in the High Street. The building opened for worship on 25 March 1799, shortly before the first Pastor, Rev James Pilkington, was inducted in June 1799. In June 1979, work started on a church extension. This added significantly more seating and completed some much needed repairs. The Methodist Church is on Eastwood Road. (Moved from the High Street in 1934). Grange Free Church is on London Road, at the junction with Langdon Road. The Salvation Army are located on the corner of the High Street and Love Lane. The building was the original 1884 Methodist Church, which was sold to the Salvation Army in 1934 when the Methodist Church moved to a larger site in Eastwood Road. Rayleigh High Street looking towards Holy Trinity Church. Rayleigh sign outside Rayleigh Lanes Indoor Market. Map of Rayleigh Town Centre. Found on wall near the Millennium Clock. Side of the Millennium Clock looking towards the Police Station. Rayleigh Methodist church from Eastwood Road. 91 High Street in Rayleigh. ^ a b "Town population 2015". Neighbourhood Statistics. Office for National Statistics. Retrieved 23 September 2015. ^ "Census 2001". Neighbourhood.statistics.gov.uk. Retrieved 13 August 2011. ^ The Cambridge Dictionary of English Place Names, ed. by Victor Watts (Cambridge: Cambridge University Press, 2004). ^ Historic Town Assessment Report for Rayleigh, 1999, pages 3 and 7. ^ Essex County Council Unlocking Essex's Past. SMR Number 45134. ^ "RAYLEIGH". OPEN DOMESDAY. Retrieved 2019-01-09. ^ "The castle at Rayleigh Mount". National Trust. Retrieved 9 January 2019. ^ "Rayleigh Historic Town Project Assessment Report" (PDF). Retrieved 9 January 2019. ^ Burrows 1909, pp. 28 58. ^ Overwhelming objections to homes plan, 2007, Southend Echo. ^ "A Vision of Britain Through Time : Rayleigh Civil Parish". Visionofbritain.org.uk. Archived from the original on 24 December 2012. Retrieved 13 August 2011. ^ "Rt Hon Mark Francois MP, Parliament.uk, accessed 8 January 2018. ^ "Rochford District Council". BBC. Retrieved 2019-01-09. ^ "Rayleigh Town Council" (PDF). ^ "Rayleigh Town Council". Essexinfo.net. Retrieved 13 August 2011. ^ "contact us". Rochford Council. Retrieved 2019-01-09. ^ "our offices". CAB. Retrieved 2019-01-09. ^ "Arriva Southend". Arriva. Retrieved 2019-01-09. ^ "Bus Times". First. Retrieved 2019-01-09. ^ "Great Anglia". Great Anglia. Retrieved 2019-01-09. ^ "X30". first group. Retrieved 2019-01-09. ^ "Glebe Primary Prospectus". Retrieved 30 October 2014. ^ "photo". Geograph.org.uk. Retrieved 13 August 2011. ^ "King George V Playing Field page 7". Rayleigh Town Council. Retrieved 2019-01-10. ^ "Sweyne Park Pond:: OS grid TQ7991 :: Geograph Britain and Ireland – photograph every grid square!". Geograph.org.uk. 15 October 2007. Retrieved 13 August 2011. ^ "Woodlands, Parks and Open Spaces | Kingley Woods". Rochford.gov.uk. Archived from the original on 24 July 2011. ^ "Kingley Wood photo". Geograph.org.uk. Retrieved 13 August 2011. ^ "Rayleigh". Rochford District Council. Archived from the original on 15 June 2011. Retrieved 9 December 2011. ^ "Smallest council house for rent". BBC News. 14 July 2008. ^ "Rayleigh Windmill". Rochford District Council. Archived from the original on 19 August 2010. Retrieved 9 December 2011. ^ ser (17 November 2005). "Rayleigh Mount". National Trust. Archived from the original on 29 June 2011. Retrieved 13 August 2011. ^ "Parish of Rayleigh Website". Parishofrayleigh.org.uk. Retrieved 13 August 2011. ^ "Rayleigh Methodist church Website". rayleighmethodistchurch.org.uk. Retrieved 21 February 2013. Burrows, John William. (1909). Southend on Sea and District: Historical Notes. ISBN 0-85409-642-6. English Place-Name Society. (2008). The Survey of English Place-Names: Rayleigh. Institute for Name-Studies. Retrieved 2008-06-28. Percival, Geoff. (2007-06-05). work= Overwhelming objections to homes plan. Southend Echo. Retrieved 2008-06-28. Rayleigh Civic Society. (2006). History of Rayleigh. Rayleigh Chamber of Trade and Commerce. Retrieved 2008-06-28. Rayleigh Civic Society. (2006). Holy Trinity Church. Rayleigh Chamber of Trade and Commerce. Retrieved 2008-06-28. Saint, Andrew (1970). "Three Oxford Architects". Oxoniensia. Oxfordshire Architectural and Historical Society. XXXV: 53 ff. Archived from the original on 28 September 2007. Retrieved 3 November 2009. Southend-on-Sea and District Historical Notes, John William Burrows, 1909, p. 1, web (August 2010): JWB-p1. This page was last edited on 8 April 2019, at 15:39 (UTC).